Heartburn, undifferentiated dyspepsia and functional dyspepsia are common and management requires an individually tailored combination of lifestyle modification and drug treatment. 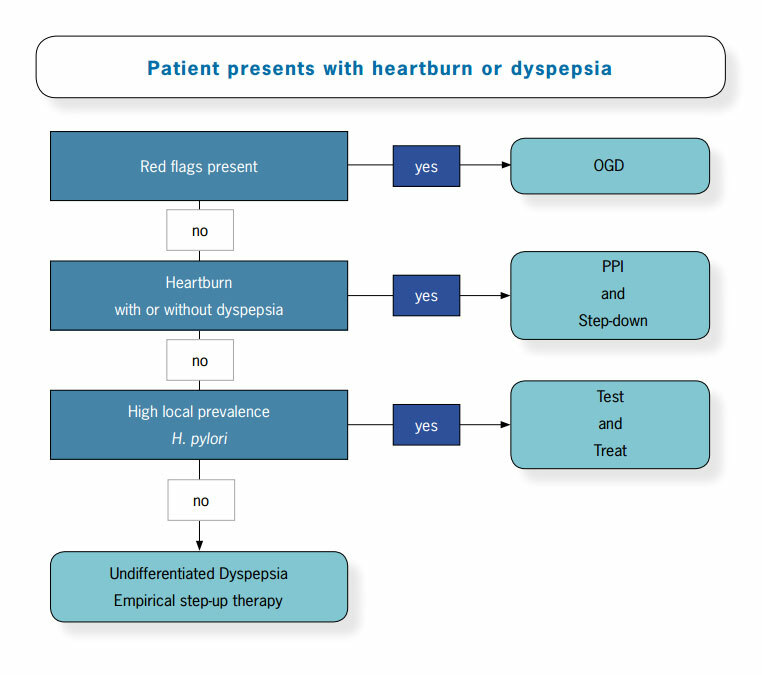 In the absence of red flags, the presence of heartburn with or without dyspepsia is the single most important feature determining management when a patient presents with indigestion. Heartburn, undifferentiated dyspepsia and functional dyspepsia are common. Management requires an individually tailored combination of lifestyle modification and drug treatment. Heartburn is a burning sensation rising from the epigastrium toward the neck. Dyspepsia is pain or discomfort located in the epigastrium. Associated symptoms may include fullness after meals, bloating, belching, early satiety, anorexia, nausea and vomiting. The symptoms of dyspepsia may be episodic, recurrent or chronic and whilst many symptoms are associated with food this is not always the case. Undifferentiated dyspepsia is dyspepsia that has not been investigated. In a person at low risk of underlying pathology this can be managed empirically without further investigation. Functional dyspepsia is dyspepsia, which has been investigated and no underlying pathology found. The management of dyspepsia associated with underlying pathology, e.g peptic ulceration or use of NSAIDs is not discussed in this article. A number of features in the initial history or examination of people with dyspepsia or heartburn increase the likelihood of significant organic disease. These red flags are detailed in Table 1. Red flags are indications for further investigation with OGD. In some cases, such as bleeding or severe dysphagia, this needs to be done immediately. When there is less urgency, people need to be off PPIs or H2RAs for two weeks prior to OGD as these can mask signs of organic disease. Antacids may be continued. In the absence of red flags the presence of heartburn with or without dyspepsia is the single most important feature determining management. Heartburn with or without dyspepsia is usually related to lower esophageal dysfunction and the presence of GORD. This often follows a large meal or is related to obesity; people with a BMI of 25 or above are at much greater risk of getting GORD. Heartburn needs to be differentiated from other causes of similar symptoms such as cardiac disease. If there is no response to full dose PPI after three months double the dose. Trial this for 3-6 months and review. If the person fails to respond, or if symptoms recur within one month after the end of treatment, consider OGD rather than long-term empiric treatment. People with heartburn can often step-down to intermittent therapy taken either in response to heartburn or when lifestyle indiscretions make it likely. Up to 20% can stop medication without recurrence of symptoms. Heartburn or dyspepsia is often due to or worsened by lifestyle factors. Modification of these factors may reduce or resolve symptoms without the need for drug treatment or allow the use of lower drug doses or intermittent therapy when symptoms worsen. Offer simple lifestyle advice; including healthy eating, weight reduction, smoking cessation and limiting alcohol intake. Advise avoidance of trigger factors if these are known to aggravate symptoms. These may include, bending, alcohol, chocolate, spicy food, fatty food and smoking. If people have reflux symptoms, weight control, eating smaller meals, avoiding fat and not eating before going to bed are often helpful. Is there a significant underlying pathology? Why has the person decided to present with the problem at this time? Dyspepsia is extremely common with a prevalence of 23-41% in OECD countries. Most people with dyspepsia do not seek advice about it from their GPs and often accept symptoms as part of their lifestyle and dietary habits. This explains the widespread availability and purchase of over the counter (OTC) antacids, H2RAs (e.g. ranitidine) and PPIs in some countries. It has been estimated that only 25% of people with symptoms of dyspepsia actually seek medical advice3 but because it is so common dyspepsia accounts for between 2% and 7% of visits to GPs. Dyspepsia can occur at any age but in older people it is more likely to be associated with organic diseases such as peptic ulcer or gastric cancer. NSAIDs are a major cause of dyspepsia and peptic ulcer and are more frequently prescribed in people over 65, who are more susceptible to complications. It should be noted that low dose aspirin is associated with dyspepsia and increased risk of peptic ulceration. There are no accurate figures linking the prevalence of dyspepsia with ethnicity in New Zealand. However, H. pylori infection which is associated with peptic ulceration is more common among Māori and Pacific Island people. If a person has no red flags but there is a high (> 30%) local prevalence of H. pylori it is worth testing for H. pylori. The best tests for this are the H. pylori faecal antigen and the breath test. Both are available in NZ but the faecal antigen test is a lot cheaper, funded and more readily available. Patients should be off PPIs for two weeks before both of these tests. The sensitivity and specificity of both tests (about 95%) is very much better than serology. In clinical use, serology has a sensitivity and specificity ranging from 68-80%, although in some research studies can reach the 90-95% level. The quality of serology depends on the matching of the local H. pylori with the commercial kit used for the assay and very few are actually validated for local consumption. Although serology is cheap and convenient it is no longer regarded as the test of choice. People, for whom H. pylori testing is either not indicated or is negative, can be treated empirically as undifferentiated dyspepsia, as long as they have no red flags. The use of antacids, alginates and over the counter H2RAs are effective for many people with intermittent mild symptoms of dyspepsia. However many people do not seek medical advice and become chronic users of OTC antacids and H2RAs. Many of these people will benefit from advice on lifestyle modification or a trial of full dose drug therapy. The preferred drug treatment for undifferentiated dyspepsia is contentious due to inconsistent study design and interpretation of the literature. A vast majority of clinical trials show a placebo response of about 40%, and some even higher4, making any effects of drug treatment difficult to measure. Another major problem is that many studies do not differentiate between two distinct patient groups, those with heartburn with or without dyspepsia, and those with dyspepsia alone. This is important, as heartburn is predominantly due to reflux of acid into the oesophagus, but dyspepsia without heartburn is often related to reduced GI motility and other factors. This distinction significantly affects the success of the various drug treatments available and has failed to be taken into account in some international guidelines. Overall, prokinetics appear to be the most effective drugs for functional dyspepsia. This supports the theory that this condition is most often due to a motility disorder rather than over-secretion of acid. The two main prokinetics used in clinical trials were cisapride and domperidone. Cisapride is no longer available and there have been recent concerns about cardiotoxicity associated with domperidone. There is insufficient evidence to support the widespread use of metoclopramide for functional dyspepsia and there is a risk of extrapyramidal effects with this drug. In practice, drug choice is usually between a PPI and an H2RA because of the adverse effects of prokinetics. These figures are based on a Cochrane review in which people presenting primarily with heartburn were excluded.5 The most recent Cochrane Review4 did not find any conclusive evidence of superiority of either agent in the treatment of functional dyspepsia and the authors concluded that H2RAs might still be the drugs of choice in this condition on the grounds of cost. The standard doses of H2RAs are famotidine 20 mg BD and ranitidine 150 mg BD. These doses can be doubled for severe disease. If H2RAs do not control symptoms it is appropriate to step-up to PPIs until symptoms are under control and then to step-down again. Functional dyspepsia is the most common diagnosis after OGD accounting for approximately 45% of cases. It refers to people with symptoms and a normal OGD (i.e. exclusion of peptic ulcer, oesophagitis and malignancy). Other diagnoses include; oesophagitis 29%; duodenitis 3%; gastric ulcer 4-9%; duodenal ulcer 6-9%; cancer of stomach or oesophagus 0.3-2%. Erosive duodenitis and gastric erosions are considered to be part of the spectrum of peptic ulcer disease. The role of hyperacidity in functional dyspepsia? Although antisecretory drugs are used extensively in the treatment of functional dyspepsia, there is little evidence that excess acid secretion is involved in the aetiology of this condition.4 The cause of functional dyspepsia is multifactorial so acid suppression with PPIs or H2RAs is not always helpful in treatment. The reason why antisecretory drugs are sometimes effective is not clearly understood but it may in part relate to the fact that a significant number of people have acid reflux symptoms associated with their dyspepsia. It is important to provide reassurance that there is no underlying organic pathology. Encourage lifestyle changes such as diet, weight control, smoking cessation and alcohol moderation and manage in the same way as undifferentiated dyspepsia.